Meijer once again made Christmas very merry when it surprised a customer in each of its 230 stores by “gifting” them their entire shopping cart during the third annual Very Merry Meijer event. The cashiers didn’t know it, but they received something special too. Board Director Doug Meijer helps a young customer get a ride on the iconic penny pony, Sandy, during the third annual Very Merry Meijer event. A surprised customer sheds a tear as Board Director Doug Meijer hands her a Meijer gift card during the third annual Very Merry Meijer event. Board Director Doug Meijer chats with a young customer at the checkout lane after gifting her family their entire purchase. A mother and daughter smile for the camera after being gifted their entire shopping cart at the third annual Very Merry Meijer event. 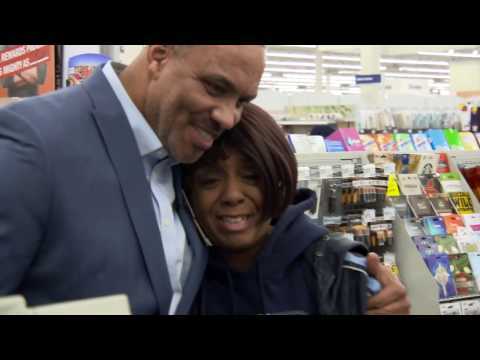 A Royal Oak Meijer cashier was pleasantly surprised after Board Director Doug Meijer gifted her a $100 gift card during the third annual Very Merry Meijer event. A Meijer store employee poses with Board Director Doug Meijer after receiving a $100 gift card by surprise. Board Director Doug Meijer chats with customers who were just gifted their entire shopping cart during the third annual Very Merry Meijer event. A Shelby Township Meijer cashier sports a giant smile after learning that the family in her lane was just gifted their shopping cart. Board Director Doug Meijer surprises a Shelby Township Meijer cashier with a $100 gift card as part of the Very Merry Meijer event. A family chats with Board Director Doug Meijer after being gifted their shopping cart during the third annual Very Merry Meijer event. Board Director Doug Meijer helps bag some toys at the checkout lane during the third annual Very Merry Meijer event. Board Director Doug Meijer surprises this unsuspecting customer with a $100 Meijer gift card. Chippewa Valley High School Athletic Director Chad Hottle greets Executive Director Doug Meijer as he and his students shop for Christmas gifts. Shelby Township Meijer Store Director Ying Vang chats with Chippewa Valley High School Athletic Director Chad Hottle after gifting him and his students their entire shopping cart. A Chippewa Valley High School student is pleasantly surprised after learning her purchases for a family in need would be covered by Meijer as part of the third annual Very Merry Meijer event. Chippewa Valley High School students and the athletic director pose with Shelby Township Meijer Store Director Ying Vang during the third annual Very Merry Meijer event.